eplacing your Corvette's wiring is not really a difficult job, but it can be frustrating, especially if you don't know the correct way to approach the process. Basically, the installation is a disconnect and reconnect exercise, carefully taking one step at a time. No real mechanical knowledge is necessary, and only normal hand tools are required. In other words, even you-with-the-10-thumbs can do it! I rate this resto at FF-2 (Fear Factor of #2 on a scale of 10), nothing to be afraid of. FF-1 is attained by even thinking about rewiring your car! The new wiring harness I am installing is from Corvette Central (part number 663017 for the four-speed), and every wire color and connector is an exact duplicate of the original installed at the factory. This car is currently a daily driver (in good California weather), so the engine compartment has not yet been detailed. If you're doing a show-quality restoration, you could clean and detail each area as you proceed across the firewall with this wiring harness. Replacing the wiring not only looks great, but provides a margin of safety over the quarter-century-old originals. Some of the factory wires I removed were literally falling apart from heat and age. Several wires had strands broken at the connectors from constant moving over the years. In other words, electrical failure was imminent, resulting in fire! At the time you replace your harness, you should inspect all the other items connected to it. This car had the original coil removed and a MSD Blaster coil and ballast resistor installed in the dim past (original wires snipped and spliced-YUK!). Also, the original 26-year-old Delco horn relay, which in this Corvette functions as much more than just a horn relay, was broken at the plastic mounting and wire-tied to the vacuum hose harness and needed replacement. We retrieved a new relay at the local auto supply (Standard #HR-140) and a new replacement coil. 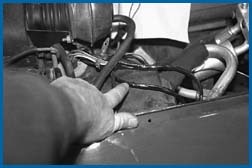 Corvette Central has complete wiring harnesses for 1953 to 1982 Corvettes, but you must tell them your options and whether you have an automatic or four-gear transmission. The '71 I am working on has three separate front harnesses, the A/C harness from thumb wheel control to the A/C compressor, the engine harness from the firewall connection to the starter, and the front wiring harness from the firewall forward to the lights and horns. This forward harness also houses the fiber optics for the lights, and we will show you how to replace it in an upcoming issue of Corvette Fever. Remember to disconnect the battery when doing any electrical work, unless you want to do a radical makeover on your hairstyle. If you don't have a factory assembly manual with wiring diagrams for your particular Corvette, I recommend you get a diagram from Corvette Central when you order your new harnesses. While you most likely will not need it for the installation, it's always nice to have in case you forget whether the purple wire or the yellow wire starts the car! To accomplish this installation, allow a full day for the novice restorer, an afternoon for the experienced enthusiast. 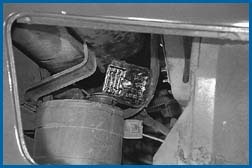 Our original horn relay had broken free of its mounting and someone had attached it to the front harness with a tie wrap. This relay is a main connecting point between the starter motor and the electrical system. If it fails, you're in trouble. We are replacing it. The previous owner added an MSD Blaster coil and ballast resistor, cutting and splicing the original harness wiring for the installation. We are removing both, and going back to the factory setup. Some of the wiring at the blower motor was cut for some obscure reason. This will be remedied with the installation of the new harness. 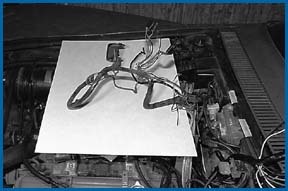 If you have wires like this, a wiring diagram from Corvette Central will be a valuable tool for tracing its location and purpose. Here is the four-speed harness and callouts as to where each connection goes. We simply unplugged the original and replugged in the new connections at the same location. 1-Firewall connection block; 2-Red harness wire to the horn relay; 3-Connectors to two additional relays next to the master cylinder; 4-Positive wire to the coil; 5-Windshield wiper motor connections; 6-Transmission switch plug-in connector; 7-Blower motor connections; 8-Windshield wiper blade limit switch plug; 9-Starter motor connections and ground wire; 10-Idle stop solenoid switch connector. A new standard replacement coil and horn relay (Standard #HR-140) will be installed in place of the MSD Blaster and original broken relay. Both items are available at your local auto supply, but you might have to special order the relay. To gain easy access to the firewall connectors, I removed the egg crate grille on the driver's side. If your Corvette is earlier or later, without removable grilles, you will have to get at the connections from under the car. It won't be difficult, but you'll need a floor jack and jack stands for safety. When the two Phillips-head screws at the top edges and a 3/8-inch nut on the bottom stud are removed, the grille will come right out. Looking in through the grille hole you can see the connector. A 3/8-inch fixed bolt retains the plastic connector to the firewall. I used a short nut driver with a deep socket to get at the recessed bolt head, and easily unscrewed it. The attaching bolt does not come out of the plastic housing; it simply unscrews from the firewall connector. Here is the connector unplugged from the firewall. You can see the fixed bolt in the center. The two plugs separate by pulling them sideways (arrow). 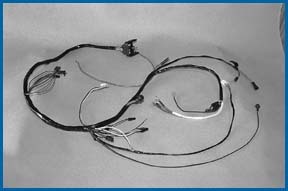 The left connector services the front headlight harness. I'll meet up with that one again in the future. After I separated the two plugs, the heavy gauge red wire was disconnected from the horn relay and the harness end worked up from under the fender. I taped the red wire to the harness, as it kept getting caught on everything while trying to get the harness out. The first connections are the two small relays pointed out by the arrow. At this point, I installed the new harness at the connector and reattached it at the firewall. Do not overtighten the center bolt, or you could crack the plastic connector. Attach the red wire temporarily to the old horn relay. I pulled the new harness up onto the windshield and moved the old wiring to the right side (arrow). Leave the egg crate grill off until you test start the car and try the wipers and blower motor. After inspecting the various connections, I unplugged the old horn relay and installed the new one. It mounts to a stud on the inner fenderwell with a 7/16-inch nut. Reinstall all the plug-in connectors and the red wire. After changing the coil and securing it in the original bracket, I connected the yellow coil wire from the harness to the positive side and reconnected the distributor wire to the negative side. Now route the idle solenoid connector wire along the valve cover and plug it into the solenoid at the carb. Good progress is now being made. The coil is connected and the windshield wiper motor is next. Carefully remove the plastic cover on the motor and unplug each connector while replugging in the new wire. Doing it like this will insure making the right connections. The old harness is now getting longer, and I continue to move it to the right as new connections are made. Since this old harness is starting to get cumbersome, I cut it off just after the windshield motor connection. You can do the same if you choose. I cut all the old plastic connectors from the used harness for future use. Here you can see how nice the new wiring looks. The wiper motor is now ready for operation. You can detail the firewall as you go if you're doing an engine compartment detailing along with this harness installation. There is a large rubber plug in the harness that connects to the windshield wiper blade limit switch. It simply unplugs and the new connection is made. A thin harness pigtails off the starter harness and is routed through the factory retainers and over to the blower motor connectors. One is a push-on connector and the other a male plug-in connector. When you look under the fender their location is self-explanatory. The remainder of the harness is now snaked down to the starter motor. Observe the wires from the old harness and where they connect to at the starter solenoid. Label them to be sure. Disconnect the old harness, battery cable and ground wire, and pull the harness out of the car. Reconnect the new harness and tighten the nuts. Reconnect the battery and start the car. Try the wiper and blower motors, toot the horn, replace the egg crate grille and you're done! Was I right? A FF of no more than a measly #2!